Angel Island is a pocket of nature in the middle of the bay. It has some of the Bay Area's most spectacular views and makes a great all-day outing. The best view is from the summit and is worth the huffing and puffing on the way up. There is a popular beach and picnic area at Ayala Cove near the boat landing. Access to the park is by boat from Tiburon or San Francisco. 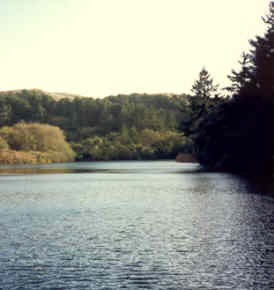 Armstrong Redwoods is located just north of Guerneville in Sonoma County. This small and heavily-used park contains the largest redwoods between Big Basin in Santa Cruz County and Hendy Woods in Mendocino County. The Golden Gate National Recreation Area includes the Marin Headlands, Rodeo Lagoon, Tennessee Cove, Muir Beach and Stinson Beach. Stinson Beach is a good place for sunbathing and swimming. Tennessee Cove is reached by an easy trail from Tennessee Valley Road, allowing the hiker to reach a West Marin Beach without a long, slow drive over the hills. To get to Cataract Canyon, continue on Bolinas Road from Fairfax until you cross Alpine Dam (It’s the only dam you cross), continue along the lake shore until a Hairpin right turn where the road turns away from the lake shore. Stop at the hairpin. Park there if you can, otherwise turn around and park at the closest space along the lake shore. There is no place to park or safely turn around for miles past the hairpin. The Cataract Trail starts at the apex of the hairpin turn, continues along the lake shore for about half a mile, then climbs steeply past numerous waterfalls in a fern-lined canyon. When you reach Laurel Dell picnic area, you have passed the last fall. The view from the East Peak of Mount Tamalpais is a Bay Area classic. 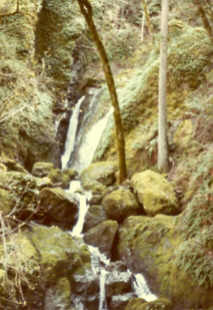 Less well-known are the waterfalls and redwoods of Steep Ravine or the azaleas of Potrero Meadows. Muir Woods was the first grove of coast redwoods to receive federal protection. The redwoods grow in a narrow valley and the Hillside Trail offers interesting views of them from half way up. The park is both small and heavily-used, but longer hikes are available by crossing into Mount Tamalpais State Park. With large second-growth redwoods in a streamside environment, Samuel Taylor State Park is a popular picnic location. The trail up Barnabe Mountain has great views of West Marin. The Pioneer Tree loop passes some old-growth redwoods in Wildcat Canyon before reaching the Pioneer Tree itself, and is an easy hike.